I always love it when fellow collectors and photographers share some of their behind the scenes photos. I always find it extremely helpful to see what other people do as far as styling and photographing their collection. 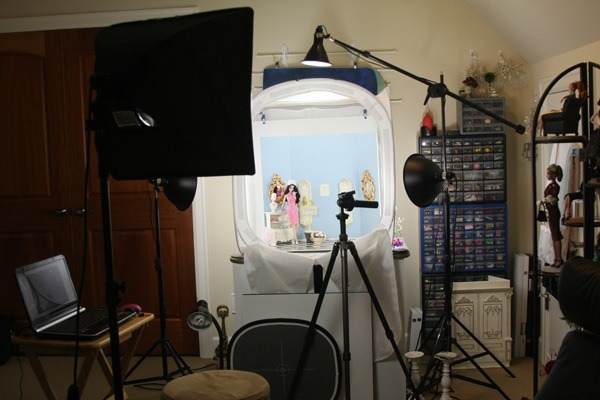 I thought I would do the same and share what my set up looks like when I do a fashion doll shoot. Keep in mind that I live in the Pacific Northwest which means there is little to no light from November through July . 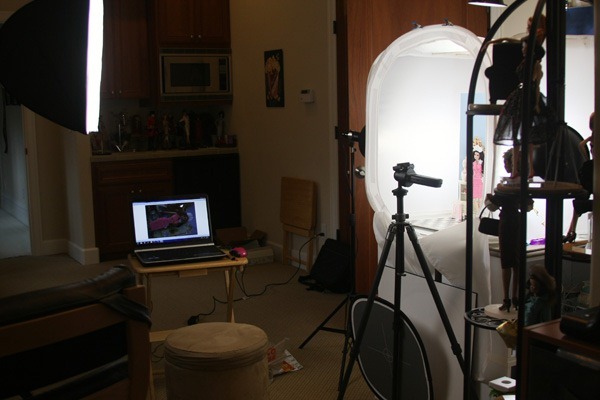 That may help explain what most would consider ‘overkill’ when it comes to lighting. This entry was posted on April 19, 2011 by raberry65. It was filed under Doll photography and was tagged with Doll Photography, Insie the fashion doll studio, Rebecca Berry Photography. I know what you mean about lighting. That big light looks awesome. Is that a Cocoa Crisp Gene I see on the right? I just love my big soft box light! It comes in real handy during the long winter to spring months. What’s up with this spring anyway??? Where is it?? Yes, that is indeed a Cocoa Crisp Gene – what an observant eye you have. I have three of the larger scale ladies. I love the styling and clothing of the Gene and Tonner dolls but just don’t have the space to collect both 1/6 and 1/3. Wish I did!